Band member Chris Peet shows his versatility by playing drums as usual but also handling bass on a number of tracks.as well Guests add bass on other tracks, plus guitar parts, horns, and other assorted instruments and background vocals. There are 18 musicians in total. JP says they are people he has played with and admired over the years. They certainly do an admirable job on this album. “Ain’t No Dania Beach,”an homage to Soars’ South Floruda home, is an appropriately breezy, beachy song to start things off. Then the mood turns tough and funky for “Sure as Hell Ain’t Fooling Me.” “Southbound on I-95” is a road song as only Soars could deliver it, with an aggresve surf sound. The mood changes drastically for “Shining Through The Dark,” a feel-good song that has great Southern-rock guitar and fantastic sax from Terry Hanck. The tenor and baritone sac combination works great with the honky tonk-style piano on the rocking “The Grass Ain’t Always Greener.” JP then reaches back to his roots for a lively acoustic instrumemtal, and a bonus track has a bit of banter thrown in. That is followed by “Satisfy My Soul,” a soulful number with very effective use of the horns. 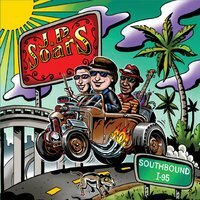 We get a bit of Soars’ life story in “Born in California,” and we also get some masterful electric cigarbox guitar from Soars as well He then moves to pure blues with a cover, Albert King’s”When You Walk Out That Door,” with Jimmy Thackery playing guitar as well and taking the first solo. This is followed by another cover, Muddy Waters’ ‘Deep Down in Florida,” with special guest Albert Castiglia, who takes hfirst guitar solo and sings the 3rd and 4th verses. This song is a perfect fit for these musicians and this album,. The album ends with “Go With the Flow,” another gypsy jazz instrumental. That makes 14 fabulous songs, most of them with Soars’ distinctive vocals. i think you will love this album from start to finish.